In the rocky hills of southern Oklahoma, just 15 minutes from Lake Texoma, there is a wilderness opened for adventure and personal growth—Pettijohn Springs Christian Camp (PSCC). PSCC provides an environment immensely suitable for spiritual growth and for building and strengthening relationships. PSCC has a great history, an amazing tradition, and a respected reputation. The Camp has a number of natural springs located on the property. In 1924 the area was established as a spa and resort, with a lodge, cabins, and a huge swimming pool. It grew and became very popular after the construction of US Highway 70. The resort closed in 1939, when the lodge was destroyed by fire. The land then changed hands several times until Earl and Sylvia Ayres purchased it in 1962. Mr. Ayres had long dreamed of a church camp in this area. At his passing in 1968, his family deeded the original 60 acres to become Pettijohn Springs Christian Camp. On December 26, 1968, the Madill Record declared, “Pettijohn Springs Is Coming Back to Life!” and predicted “the surroundings will ring with the sound of happy children.” In June 1971, the first summer camp session was held. Since that time the facilities have grown to include approximately 135 acres, climate-controlled cabins, 5-acre lake, recreation areas, Little Chapel, a full-service dining hall, covered pavilions, swimming pool, Retreat Center, and many other wonderful amenities. PSCC has been in operation for 40 years and thousands of youth and adults have enjoyed enriching their lives in this spiritual and natural setting. PSCC is a highly effective and extremely necessary mission work going on in our own backyard. A board of faithful members of the churches of Christ from Oklahoma and Texas oversee the facilities and services provided by the Camp. 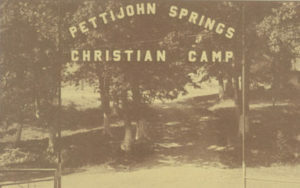 Pettijohn Springs Christian Camp is operated year-round, providing facilities for summer sessions, retreats, workshops, reunions, and other activities.